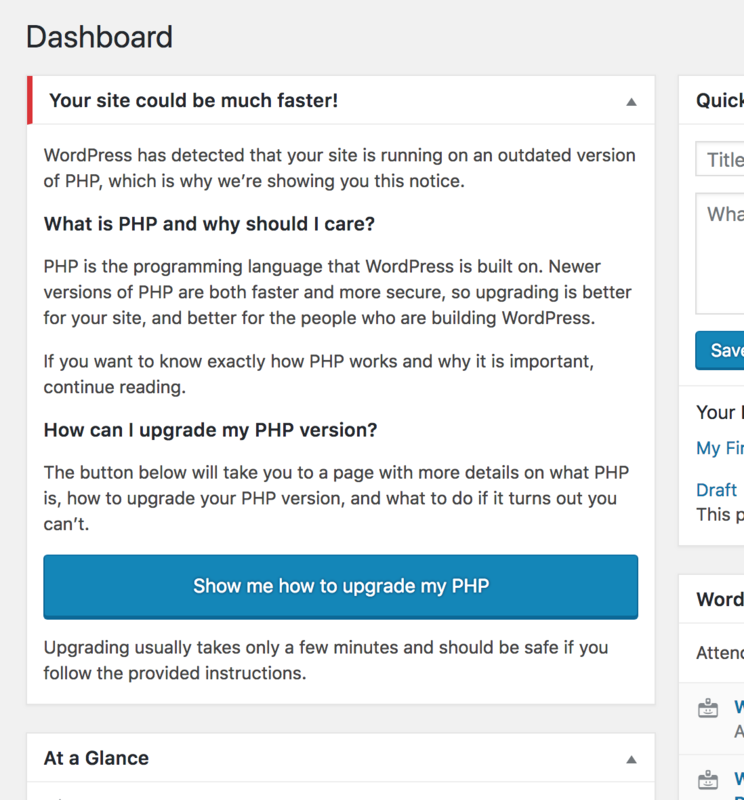 The voice of the widget text has been adapted to better match the overall WordPress feel. The accessibility concerns that were raised have been addressed. The Trac ticket was flagged for ui-feedback and we are now waiting for the #design team to be able to go over the ticket. Once all of their feedback has been processed and incorporated, the version in trunk will be ready to discuss backporting it to the next minor release (4.9.6). @sergey intends to work on a first implementation of the above ticket. To start work on this ticket, we created a new branch servehappy-require-php in the https://github.com/wp-core-php/wordpress-develop repository (link to branch). Anyone wanting to contribute to this repository should DM @schlessera to be added as a contributor (with an email or Github username). @afragen has built a first proof-of-concept to check a plugin’s header requirements: https://github.com/afragen/requires-php. Testing and feedback are welcome! Next meeting will take place on Monday, April 2, 2018 at 15:00 UTC in #core-php. Agenda: [Go over #design feedback and] discuss how to proceed with plugin requirements. If you want to know exactly how PHP works and why it is important, continue reading. The text following that doesn’t cover the above, so I’d say either remove it, or add a link pointing to an appropriate resource and replacing ‘continue reading’ with something like ‘read this article’.